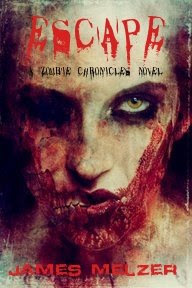 The Zombie Chronicles: Escape is the first in a trilogy of podcast novels by James Melzer. A passing asteroid leaves a trail of death behind it. The dead come to life and wreak havoc. 25 years later the government has gained control over the zombie population. Citizens volunteer for a special government project to donate blood in which they use it to create human clones to feed the zombies. The government has other ideas though. One man begins to discover what that secret is and goes on a crusade to rescue his clone. If you're like me and you want to listen to more than just music in your car or while you're sitting at your computer working. Then I would recommend this. I am anxious to see how this story further evolves. You can download it via podiobooks.com, or though iTunes.